Frist the customer service was good.I have handled this sword befor,when a friend of got one.It cut single mat fine along with assorted water bottles.Mine is great,the blade came sharp enough to cut thin paper and regular white paper.True swords had the best price,I could find.The sword is very attractive,This is one of the best swords of this type out there on the market!.I'am really glad I purchased this sword. Good sword, totally matched with my expectation, plus fantastic delivery speed! I have been collecting swords for a long time and must say that this sword is easily the best made in my entire collection! Everything from the rosewood scabbard to the brass fittings make it a must have for any true collector. As far as the blade itself goes I didn't even have to sharpen it, unlike most swords I have ordered, this one came razor sharp. I was looking for a new sword to do my Gung Fu and Taichi Practice and after much searching I found the Cold Steel Battle Ready Gim/Jian. I was skeptical as could be about this product specially since I was under the impression that there was no way that a battle ready sword could be obtained for under $800. I got the money together and bought it thinking that even if it was just another hyped up wall hanger I would have another practice and tournament sword. Wow I was skeptical for no reason. When it arrived I was absolutely amazed with this sword. It felt so solid I thought it was too good to be true. Even though I saw a video of it doing all kinds of things such as pullups being done on it and getting bent on a vise and popping back to its place I was still worried the one that was shipped wasnt as good. So I put it through some of the test. It flexible, strong, well balanced and cuts like a real sword should. It was not as sharp as some I have seen that can cut through paper but I think maybe it was dulled down a bit for shipping. Either way it doesnt need to be that sharp just the grace one can wield that sword with is enough to cut through anything with out even a smudge on the polish. I'm very happy with this sword and would highly recommend it. I still cant believe this sword is sold for this price. I'd been looking for a good-quality jian sword, and let me tell you the market isn't big for that. 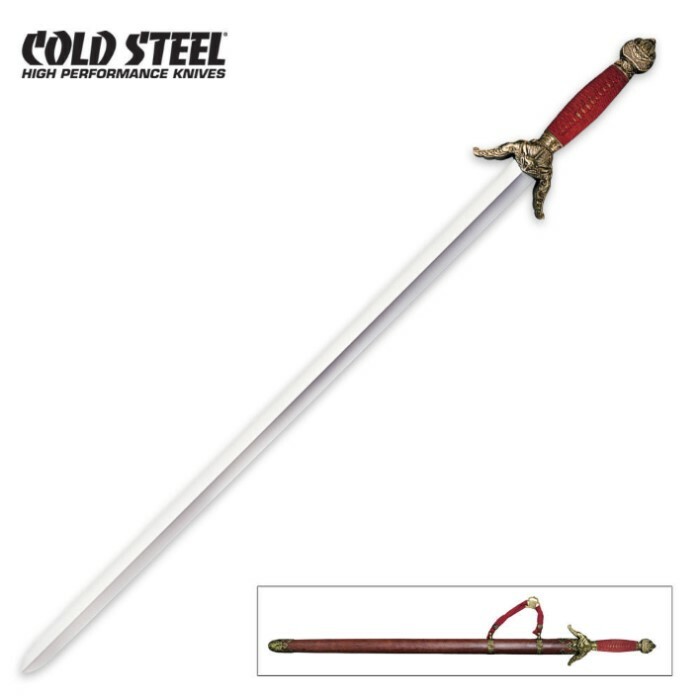 But Cold Steel's Gim looked like a good choice to me, so I ordered it. To be concise--the fittings are detailed and well-cast, the blade is sharp and nicely polished, the assembly is tight, and the wood of the grip and scabbard is beautiful. The only negatives I found were a few small spots of rust on the blade and the inside of the guard was pretty rough and unclean. But overall I think it's great. I saw the review for this sword on SBG and have lusted for it since. TS was out of stock when I first wanted it, but it was well worth the wait. The wood and brass look beautiful together, even better than the site images. This is my first double edged sword, so I haven't sliced anything other than pool noodles with it. That said, I can safely say that if there is ever a pool noodle uprising, I will be one of Earth's heroes with this sword in hand. The blade itself is long, narrow, and quite thin. It's a very flickable sword. The blade is quite strong (look up the cold steel video). There's nothing I don't like about this sword. I'm quite happy with Cold Steel and continue to be happy with True Swords.